Serbia win Hall Cross World Cup! 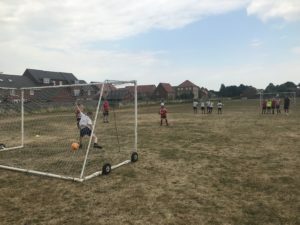 On Thursday evening 35 Year 7 students, representing 6 nations, took to the field to compete in the Year 7 World Cup five-a-side competition. Upon the conclusion of the group stages Serbia, Nigeria, England and Denmark competed for a place in the final. 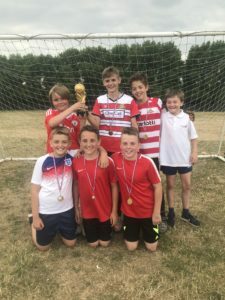 A 2-0 victory for Serbia and a resounding 4-0 victory for England set up an exciting final between the teams who finished first and second in the group stages. The final was decided by penalties. The final was a cagey affair and ended 0-0, extra-time was needed. Serbia took the lead after a VAR penalty controversy but England equalised immediately with a well worked goal from the restart. Penalties were needed to separate the two teams, Serbia eventually coming out on top, winning 3-1. 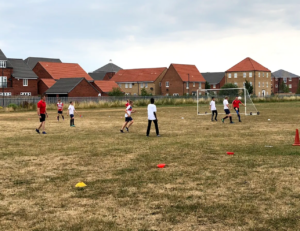 The students opted to donate the £30 raised to the British Heart Foundation. Serbia pictured with the World Cup trophy and their medals.